Purpose- This site was developed as a non-traditional informational/booking travel site. The goal is to provide readers with interesting, off the beaten path kinds of experiences that will be remembered for a lifetime. Our specialty lies in Europe and Western Canada, although we can assist with any destination you desire. We will not feature a destination in the "TRAVEL LOG" unless we or any of our experts have been there and can provide an excellent testimonial and book the destination. Click TRAVEL LOG. Resources- We work with a group of global “savvy”, expert travelers who work in, and/or own and operate travel agencies, hotels, airlines, cruise lines, rental car companies, theme parks, tour operators and consolidators, in all parts of the world. Click on “ABOUT” page on the website for more detailed information about these experts. 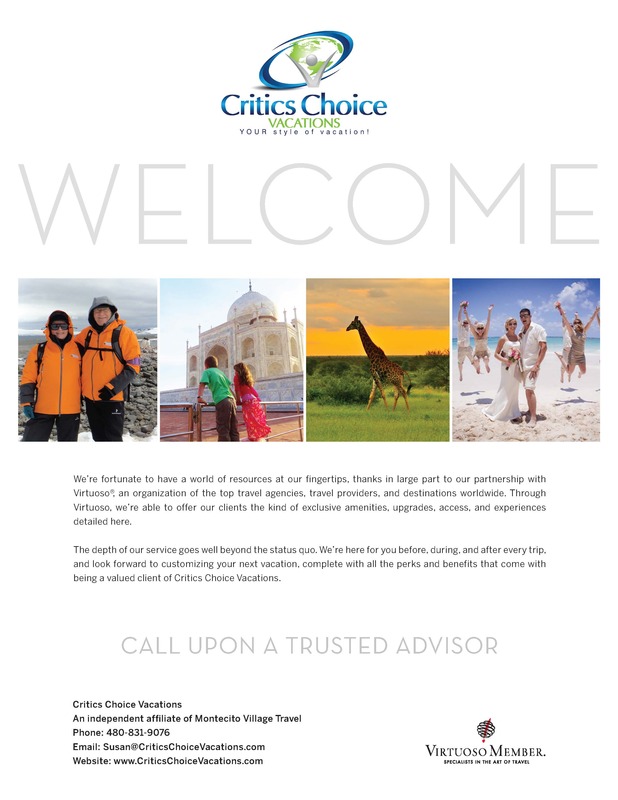 We bring a global perspective and key travel industry experience to each and every booking for you - the client. In region offices…..they live there!  Airfare – Airfare - domestic and international. Service fees may apply.  Attraction Discounts – Cards good for entry into various cities main attractions.  Mission oriented Church groups – Airfare from any point within the United States to anywhere outside of the United States. Service fees may apply. 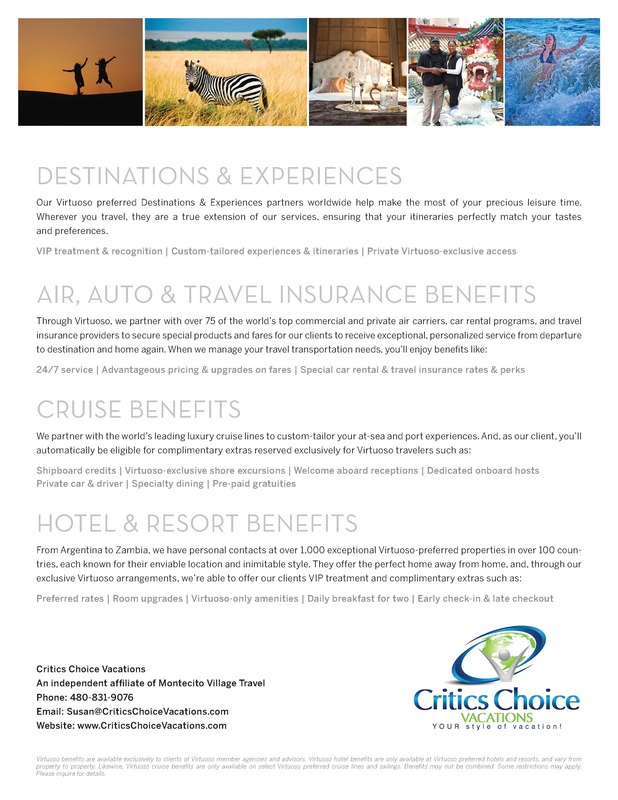  Cruises – Economy to luxury. River and oceanliner sailings. Adventure and expedition sailings around the globe. Yachts and private barges.  Homes/Hotels/Villas – Economy to luxury.  USA Offices – Our home office is in Gilbert, Arizona with several additional Arizona locations. 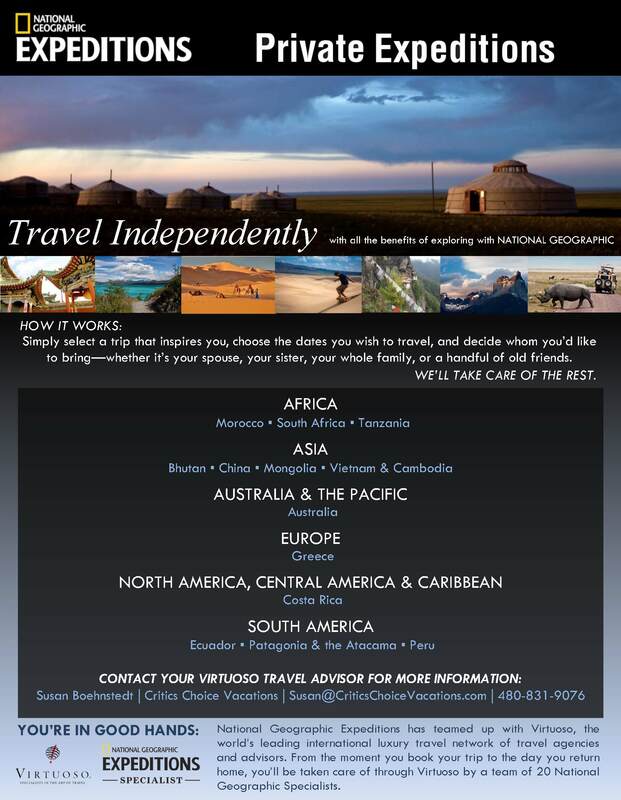  Travel Insurance – Basic to premium plans are available to cover any component of travel - domestic or international. Click on the link "BOOK yourself" to book your own insurance.  Tour packages – Packages can be coordinated for private, small or larger groups. Packages can include airfare, lodging, ground transportation, city and/or specialized private tours. Domestic and international world-wide tours are available.  Virtuoso affiliate – Rates and high profile VIP access for all Virtuoso clients.  Wine tours – Tours can be coordinated for private, small or larger groups, both domestic and international.